Hover your cursor over a row in the table to see a screenshot of the project, as well as its extended description. Numbers obtained by viewing the memory of Metroid: Zero Mission at run-time. A pretty poor-quality Metroid clone of Space Invaders. DeProgrammer wrote this in preparation for Tourk&apos;s Power, to test both his algorithm for vision in the maze and his ability to come up with a maze-generating algorithm. A program designed to rename a list of files either via a given text file or by manually inserted names. It is not very useful unless you have a list and it is in the same order in which the files are organized (usually alphabetically according to the old filenames). Capable of moving or copying files either based on dates or ignoring them. It is great for making comprehensive back-ups and then updating only the new or modified files daily. Another fairly unfriendly program, MaskMaker was intended mainly for DeProgrammer&apos;s older programs, but it still has some uses. It changes white into black and every other color into white and allows you to copy the resultant image to the clipboard. A nice-quality game designed to help a few specific people learn how to spell. Customizeable words. The background was made by Guy Perfect, and the other graphics were taken from a NASA photograph. 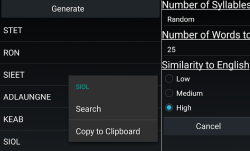 This app creates words by assembling syllables taken from the English dictionary, optionally using probabilities also obtained from the dictionary. DeProgrammer&apos;s old YouTube account, featuring videos of several of his games and him playing other games. The lyrics for the song King of Hobbies. A song DeProgrammer wrote about computer programming, although it"s not completely honest. Kinesis Animator is a GIF animation studio designed specifically for pixel artists who use spritesheets. It has a sweet "auto-find boxes" feature that will quickly locate sprites in the spritesheet and add them to the animation. Fair-quality game based on comics made by a friend. You must push each of the helpers back into the lava by shooting them. The boss is really hard to hit because it is random and rarely comes down into range. By Morrad. A minigame in which Kamek must hit specific sequences of arrows to ward off the Big Boo, surviving as long as possible. High quality. Control your cursor with your joystick. Includes horizontal and vertical mouse wheel abilities. Also has a slow mode and separate X and Y axis locks for accuracy, as well as the ability to use the directional hat or D-pad. Kind of a powerful tune that DeProgrammer enjoyed making. Fair-quality game in which you must battle five robotic bosses, shooting only the red section on their armor. Some are significantly harder than others. 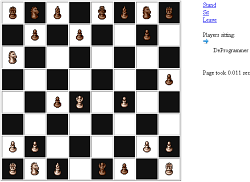 A program that can emulate keystrokes and mouse movement/clicking/wheeling. If you are tricky, you can make it do math, loops, and arrays. More commands will be implemented at a later date. 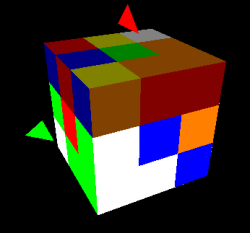 GLRubix is a Rubick's Cube game, the first 3D game DeProgrammer made.